Choose Perfect Colors with Confidence. Selecting perfect color combinations has never been easier! By popular demand Joen Wolfrom has designed a durable color-accurate double-sided multi- purpose color wheel that is perfectly sized for use in your studio workroom office or sewing room It's easily transportable! 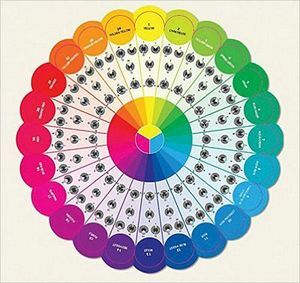 One side of the wheel features 24 pure colors with 4 essential color-plan wheels for each color. The opposite side shows a range of each pure color's tints shades and tones. Pure-color wedges are slotted so you can audition colors (fabrics paint swatches etc.) alongside them to ensure a perfect match. 12inx12in.